SCDOT and Satterfield Construction Company are working on the US 25 Widening Project in Edgefield County. 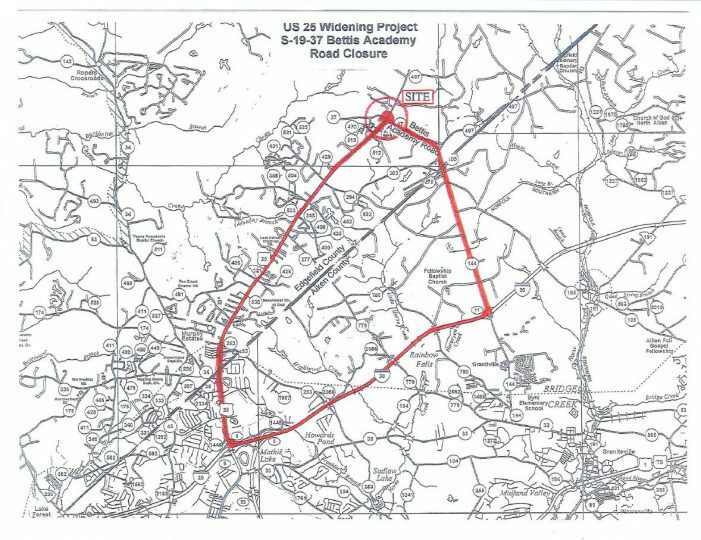 Weather permitting, S-19-37 (Bettis Academy Road) will be closed on Monday, July 23, 2018, and will remain closed until approximately August 22, 2018. As always, SCDOT and Satterfield Construction Company will make every effort to complete the work necessary to reopen the road as soon as possible. There will be a detour for this closure beginning at the intersection of US 25 and Bettis Academy Road. It will continue south on US 25 crossing into Aiken County and then to the intersection of I-20, turning east onto I-20 EB towards Columbia and exiting on Exit 11 then turning onto Bettis Academy Road heading north to the intersection of US 25. The detour is approximately 19 miles in length. Please see the attached map for the described location. 4 Responses to "SCDOT Advisory: Edgefield County"
This does not state how much of Bettie Academy will be closed, which makes a huge difference to local folks. Certainly a 19 miles detour is not necessary. (Except maybe for 18 wheelers) there are other detour options on either side of Bettis Academy from 25. ….Rainbow Falls Road for example. Customer Service at SCDOT invites you to call in your questions on the Bettis Academy Road Closing From 8-5 pm at 855-467-2368. Bettis Academy Road (S-19-37) will be closed from the intersection of US 25 to 1000 ft East of US 25. The remainder of Bettis Academy Road will be open to traffic. The signed detour will be utilizing I-20 and US 25 to accommodate truck traffic and drivers unfamiliar with the area. Local traffic will be able to utilize the secondary roads along Bettis Academy and US 25 to avoid the full length of the signed detour. Do you have a link to the original DOT advisory or is this it? Is it just the intersection being closed?